We all think bigger is better. We put maximum effort into making sure our hanging baskets are bigger than the box store down the street — an effective way to compete with them. While this strategy works, don’t overlook the high profit margin on a small plant that is an easy, quick turn. One of the most useful aspects of having a quick-turn plant is that it puts product on your shelves. The simple truth is, you can’t sell it if you don’t have it. Putting a nice 2-inch pot with a cactus or succulent near the cash register is likely to produce some easy sales. Keeping the product small and your cost low means you can lower the price, the customer is happy, and you keep a healthy margin. We all know that you aren’t going to get rich selling 2-inch pots for a few bucks at a time, but it all adds up over time. If you want to cut costs in the greenhouse world, you have to cut time. Time multiplies cost becuase with time comes more water, more fertilizer, more heat and more labor. Sometimes these extra costs are totally worth it (think wintering a Boston Fern in order to have a monster for the spring), but sometimes it’s a good idea to balance long-range plans with short-range wins. I am sure I heard this from someone else, but a good sales mantra is “Keep hunting Elephants, but make sure to eat rabbits along the way.” That big sale is always nice, but little sales in between will help you pay the bills. The purpose of our blog is to help you grow your business. Generally speaking, we don’t like to use our blog to advertise. However, today is in an instance when self promotion is mutually beneficial. One of our current specials creates a good platform to show how a quick turn can make for good profit. 1. Look for deals from suppliers. We all delete those emails with special pricing and fly-by facebook ads. There are so many that it is hard to discern the good from the bad. My advice is to slow down and think through the possibilities of deals that come your way. What could you produce quickly with this offer? Many of us in the starter plant world need to off-load product as it matures in order to make room for the next crop. We often discount this product right as it reaches its most mature state. Many times these plugs can be stepped up into a small pot and brought to market within days! At the time of this writing, we are running a special on Pink Christmas Cactus at 50 percent off our normal price. These plugs have three tiers with a fourth emerging. They are ready to go directly into a 2-inch pot for holiday sales. We need the space and our customers can benefit from the discount. Click Here to check them out. 2. Create a safety net by transplanting unsold small pots. Let’s say that you ordered those discounted plants, put them in a small pot and tried to sell them with no results. The great payoff of this strategy is that you can always pot up the leftovers and hold them for that monster container that will beat out your competitors. For example, if a Christmas Cactus doesn’t move as a 2-inch pot this year, put it into a 10-inch basket and sell it next fall for ten times the price. 3. Put extra plugs in each pot, trading more product for less time. The key here is to get a product to market with as few days in the greenhouse as possible. That doesn’t, however, mean that you can’t do a bigger, nicer pot. It just means you are going to need to put more product into that pot. 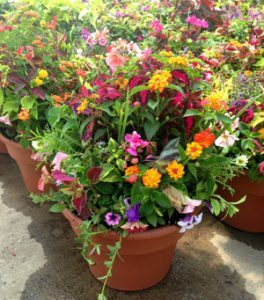 The past several years we have been selling a combo floor pot in the spring that has been a huge hit in our market. It is really just a well-thought-out match of overstocked items loaded into a pot and placed directly for sale. It has zero grow time past the starter plant stage. Look for deals and buy compatible products in order to create nice combos that are ready to move instantly. Remember, what your customers really want are choices. Some will want a large basket to go on their porch while others want a small pot to go on their desk. Continue to give your customers supeiror quality products, both large and small, and you will continue to see your market share grow. Annie Beth Donahue lives in Indian Trail, North Carolina with her husband Brad, and four children. She is a writer, editor, and consultant for both the web and print, and she can be found at www.anniebethdonahue.com.